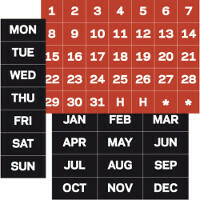 Our Magnetic Calendar Headings are easy to put on and remove from your dry erase whiteboard or calendar board. We offer headings that neatly display days of the week, months, numbers and letters in a wide range of colors, designs and shapes for easy viewing. Stock up on Magnetic Calendar Headings today for your office whiteboard.